(02-11-2019, 04:39 PM)RuralFan Wrote: Does anyone know if the Hull sisters were good jump shooters before coming to Stanford? They just seem to be too well trained not to have this shot in their arsenal. It has to come from somewhere or even next year will be a problem. I think the last guard we had who was money on the short jumper was Amber. This year that shot is coming mainly from DiJonai and occasionally from Kiana on a runner. The problem with hoping that Maya will develop the elbow shot is that shot is basically a free throw and Maya is only 50% from the line. Yes I would take that 50% on an elbow shot but FTs are uncontested. I'm not sure if freshman year Amber Orrange was a great short jumper shooter. Yes her junior and senior years. I think the Hulls will get there, hopefully sooner rather than later. I wonder if you do a statistical analysis of where the top teams make their shots, on where we would rank on midrange jumper attempts. I feel like other teams do it more often than we do, even though I think it's a perfectly valid shot that we underutilize, especially when teams crowd the paint and defend the perimeter as well as Oregon did on Sunday afternoon. I've seen DiJonai and Kiana make those FT-distance jumpers and I feel like the Hull sisters and Alanna could as well. Of course 3 points is better than 2, but sometimes you have to take what a defense gives you. Speaking of how McPhee went off against Oregon last year, I feel DiJonai has a similar playing style as Brittney, so I was surprised that it wasn't used to more effect this time around or perhaps the Ducks took greater efforts to prevent a repeat performance. In general, I feel like that has been our Achilles' heel the last few years and when a team like Oregon who has the talent, length and height to do it to great effort, our offense runs out of gas way too easily. I would love for an in-depth response from Tara, perhaps in an off-season interview when she can reveal more, about why we have these consistent struggles year after year with different personnel groupings. I wish I could find the article, but the analytics find that the mid-range jumper is the least efficient shot in basketball. As a defense, you’ve generally won if you can force the other team to take midrange jumpers, even if they aren’t well defended. The reason is obvious; field goal percentage goes down as a function of distance from the basket, but once you hit the three point line, the value of each make goes up 50%. So, unless your mid-range jumper is 50% more likely to go in than your three point shot, you are better off backing up and taking the three, or working the ball inside further to get a higher percentage two. You can see that even a closely guarded shot within 5 feet from the basket has a higher value than a wide open shot from midrange. The valley appears between 10 feet out and the three point line, and is only moderately influenced by how well defended the shot is. (02-11-2019, 11:49 PM)BostonCard Wrote: I wish I could find the article, but the analytics find that the mid-range jumper is the least efficient shot in basketball. As a defense, you’ve generally won if you can force the other team to take midrange jumpers, even if they aren’t well defended. The reason is obvious; field goal percentage goes down as a function of distance from the basket, but once you hit the three point line, the value of each make goes up 50%. So, unless your mid-range jumper is 50% more likely to go in than your three point shot, you are better off backing up and taking the three, or working the ball inside further to get a higher percentage two. Yes, I referenced these analytics when I started this line of discussion. No doubt true. And it is exactly the kind of information that methodical, analytical Tara is deeply aware of. Based on our past shooting, it is clear that Tara does want either layups or treys. However, the chart reflects averages which may not be true for certain players. There are players who make 90% of their free throws, and there are players who can practice and be trained to make a very high percentage from the elbow. If you recruit and train such a player, then you have a perfect zone-killer. If you don't, then you are utterly dependent on perfect execution to get open three point shots, and also on how dependable your shooting is from range to actually go in the hoop. And that is who we are. Consider our three point shooting. As a team for the season we are shooting .359 from three point range. Gonzaga was an anomaly, where we shot .409 and still lost. Not to be reductionist, but in all the most important games our three point shooting is pretty tightly correlated with the outcome. I suppose other things may be correlated too--rebounding, opponent's shooting percentage, etc. But the three point shooting seems to be more fickle than those other factors, and we seem to be more dependent on it this year than we have had to be in other eras. This team has probably overperformed its talent early on--if you look at the fact that we have one senior starter on the team--and it did so by shooting lights out from three. But that shooting is cooling off and we have to find other ways to win when it does. But we haven't. Maybe it will take time to develop some mid-range shooter for a hypothetically better offense, but how about the flip side of the game? Why didn't we have better defense? If we had shot 50% from 2 and 50% from 3, and had the same number of shots (even though we should have fewer shots because of fewer OR chances), we would have scored the same number of points as they did. So even that level of offense wouldn't have been enough to win the game. I appreciate your thoughts. Looking at the data, it does appear that there is some evidence that mid-range shots may be a little less susceptible to the effect of the opponents defense than either three pointers or shots from within 4 feet, which might suggest that mid-range shots may be marginally more consistent game-to-game than other types of shots. My instinct, however, is that the variability due to chance if the underlying field goal percentage is ~40% is probably greater than the variability due to opponent defense. Generally, if I were a coach of a player who had a really good mid-range jumper, I'd probably work on her range to be a really good three-point shooter than to work on being a phenomenal mid-range shooter. 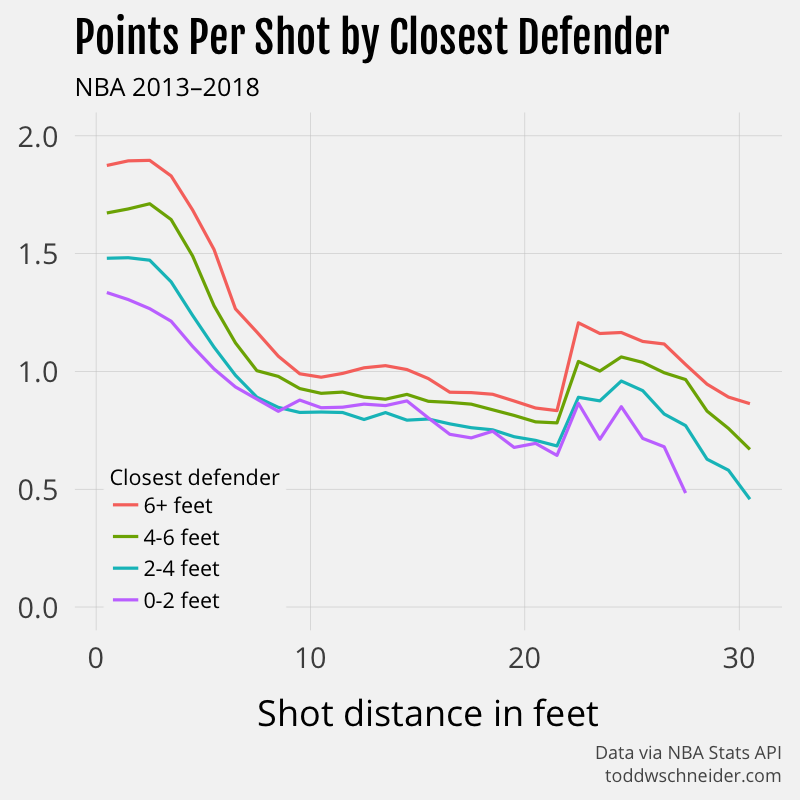 Or, put another way, even in the best of circumstances where the defense leaves the shooter wide open (no defender within 6 feet) on a 15 foot jump shot, they are only worth as much as a tightly guarded (defender within 2 feet) three pointer (note that in the dataset above, there is no distinction between a three pointer with a defender within 2 feet as one between 2-4 feet). (02-12-2019, 05:05 PM)M T Wrote: Maybe it will take time to develop some mid-range shooter for a hypothetically better offense, but how about the flip side of the game? Why didn't we have better defense? Good point re the D. On O, we actually took 3 more shots than they did, and we also had more FT attempts. It was a bad game, period, and unfortunately we seem to lay that kind of egg on national TV far too often. Having said that, the reluctant reality may be that their starting 5 are simply better than ours. They play better together, they were better prepared, and perhaps have better skills, especially when it comes to shooting. Absent better offensive production from everyone, (and yes, even from the Hulls, who have been solid), I'm not confident we can beat them this year. Certainly not in a half-court offense. I do think that Oregon is a better team than us this year. But it is possible that we have a young team that is pretty inconsistent and we just had a really really bad game. We let Cal score 81 points against us (not that different from the 88 Oregon scored against us). And then we held them to 50 points two days later. Hopefully our #2 recruiting class coming in next year will balance it a bit more, plus even though Smith graduates, four potential starters (Kianna, Maya, DiJonai and Nadia) will be upperclassmen and we will shed the inconsistency. Two-fifths of Oregon's starting lineup (Boley and Sabally) are sophomores (or a redshirt sophomore in Boley's case) so being young doesn't always mean being inconsistent. Haley Jones had a triple double in her last game. 32 points, 17 rebounds, 10 assists. And 4 steals and 4 blocks. Yes it's high school basketball but still impressive. dijonai was high scorer at 13 (no one else had over 8), high rebounder, and quite visibly the only player who could beat the oregon zone. dijonai had zero personal fouls. she has scored 30 points in games this season. yet, dijonai played only 21 minutes. 5 of her teammates played 25 minutes or more (including both hulls, who totaled 6 points between them). tara kept subbing her out to get an extra (ineffectual against oregon) hull twin on the floor. imo a rather stubborn, mis-guided roster choice. (02-12-2019, 09:01 PM)jonnyss Wrote: dijonai was high scorer at 13 (no one else had over 8), high rebounder, and quite visibly the only player who could beat the oregon zone. dijonai had zero personal fouls. she has scored 30 points in games this season. yet, dijonai played only 21 minutes. 5 of her teammates played 25 minutes or more (including both hulls, who totaled 6 points between them). tara kept subbing her out to get an extra (ineffectual against oregon) hull twin on the floor. imo a rather stubborn, mis-guided roster choice. I do wonder what Tara was thinking--I don't say that in a pejorative way--I really wonder. I suppose it was something on defense she was trying to achieve. But you are right that D was our most effective player. Not only that, when the game got out of hand, D just looked like she kept playing hard and putting out max effort. I think everyone else began to look flat. Given Tara's comments about Dijonai as a leader, I wonder if the issue is a limit on playing time to keep her healthy or manage a minor matter.